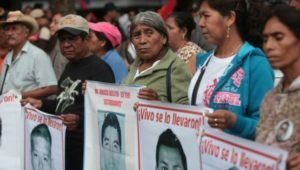 HomeAction Blog Why Hasn’t There been Any Justice for the Victims of Ayotzinapa? Two weeks ago, we published a call to action on the 23 month anniversary of the disappearance of 43 students from the Ayotzinapa Rural School. 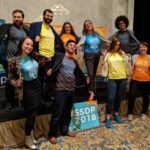 Today, SSDP Latin America Policy Intern Jacki Moreira takes a look at why investigations into the disappearances have yielded no results or arrests. 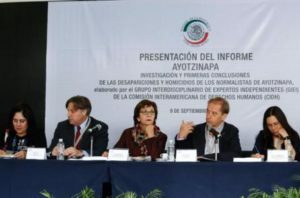 El Grupo Interdisciplinario de Expertos Independientes (GIEI) were conducted one of the only external investigations into Ayotzinapa before their inquiries were halted by the Mexican government. As mentioned in the previous blog post, the GIEI was an independent, international investigative body whose inquiry into Ayotzinapa was halted by the Mexican government. Something that was fundamental for the GIEI was to remove the control of the investigation from under the SEIDO (the organized-crime division of Mexico’s Office of the Attorney General). This agency stalled, mismanaged, and released false reports that were found to have no factual basis. The fragmented case files and withheld information meant the investigation was essentially under their control. Once the investigation was moved from control of the SEIDO however, there were still delays and blocks. The Attorney General denied them the ability to interview or reinterview state authorities who exercised their function during the night of the events. 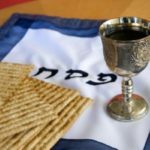 They also were not given access to interviews with military officials, and their request to turn over all documents, videos, and photos that could be used as evidence was refused by authorities. They were refused interviews with the indictees which could have offered information about the facts or fate of the disappeared. 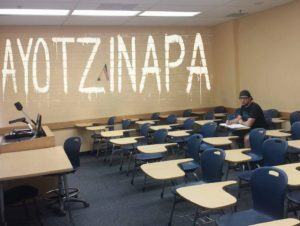 One of the primary demands of the parents and families of Ayotzinapa victims is the firing and imprisonment of Tomás Zerón. Zerón leads the Agencia de Investigación Criminal and is known as the author of the state’s “official story,” along with the former Attorney General Jesús Murillo Karam. Zerón is implicated in the torturing of witnesses, obstructing the investigation, and fabricating evidence to corroborate the official story. Zerón continues to break protocol and legality in his handling of the case. When he presented a bag with a bone fragment from the Rio San Juan, he lied about the presence of UN officials, took one of the tortured witnesses with him to the site on the day of his confession, and never presented the original videos or pictures to the GIEI. The independent investigators were sent by Zerón instead to the Coluca trash dump. Furthermore, at the site, cars from his agency blocked the path of the Argentine Forensic Anthropology Team. The government’s efforts to continuously push the investigation back to its own story is an attempt to bury the truth and prevent justice. Families of Ayotzinapa victims are calling for the arrest of Tomás Zerón for falisfying information in his investigation.